Hepatitis Delta is the most severe form of viral hepatitis in humans and is caused by infection with the hepatitis delta virus (HDV). HDV can be acquired either by co-infection (a simultaneous co-infection with HDV and HBV) or by super-infection (infection of someone already harboring a chronic HBV infection). Although HDV/HBV simultaneous co-infection in adults usually resolves completely, in some cases it can become fulminant hepatitis. In the case of super-infections (which is the predominant form of delta hepatitis), HDV super-infection leads to a more severe form of disease than chronic HBV mono-infection. Up to 90% of super-infection cases lead to chronic infection, of which approximately 70% of patients go on to develop chronic cirrhosis in 5-10 years; and development of cirrhosis can be three times higher with HDV/HBV co-infection than with HBV alone. 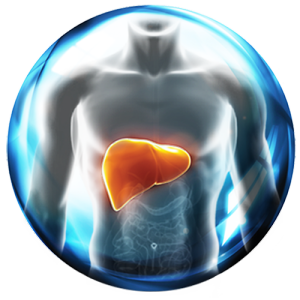 Hepatitis D infection leads to more severe liver disease than HBV infection alone, and is associated with accelerated liver fibrosis, liver cancer, and liver failure. HDV is a disease with a significant impact on global health affecting 15-20 million people worldwide. There is currently no approved therapy for HDV. The hepatitis delta virus expresses only one protein, the hepatitis delta antigen (HDAg), which comprises a nucleocapsid-like structure with the genome. There are two forms of HDAg, small and large. Together, these and the single-stranded RNA genome are surrounded by a lipid envelope, which is embedded with HBV-derived surface antigen (HBsAg) proteins. Indeed, HDV does not encode its own envelope proteins and must “steal” them from HBV. Hence natural HDV infections always occur in the presence of a co‑existing HBV infection. HBsAg is the only element of HBV relied upon by HDV, HDV replication can occur independent of HBV replication. Like HBV, delta hepatitis is transmitted parenterally through exposure to infected blood or body fluids and is associated with high transmission rates among intravenous drug users (IVDU) or those who engage in high-risk/frequency sexual activity. Intrafamilial spread occurs and seems to be common in regions of high prevalence, which is known as inapparent parenteral transmission. Perinatal transmission of HDV is uncommon. Because of screening of blood products, new infections in hemophiliacs, blood transfusion recipients, and patients receiving hemodialysis are no longer seen in developed countries. The prevalence of HDV varies between different parts of the world. Globally, HDV infection is reported to be 4.3-5.7% of chronic hepatitis B carriers. HDV meets criteria for Orphan Designation in the United States (less than 200,000 people), Europe (less than 5 in 100,000 people), and Japan (less than 50,000 people). In some parts of the world, including certain areas of China, Russia, Central Asia, Turkey, Pakistan, Africa, and South America, prevalence as high as 40% has been reported in HBV-infected patients. Fattovich, G. et al. “Influence of Hepatitis Delta Virus Infection on Progression to Cirrhosis in Chronic Hepatitis Type B.” J Infect Dis. 1987 May; 155(5): 931-935. Serrano, B. et al. “Comparing the Long-Term Outcome of Hepatitis Delta and HBV Monoinfection: Is HDV-Infection Really Worse?” Poster, International Liver Congress 2011. Session Title: Category 07b: Viral Hepatitis B & D: Clinical; Presentation Date: 31 Mar, 2011. Wedemeyer, H. et al. 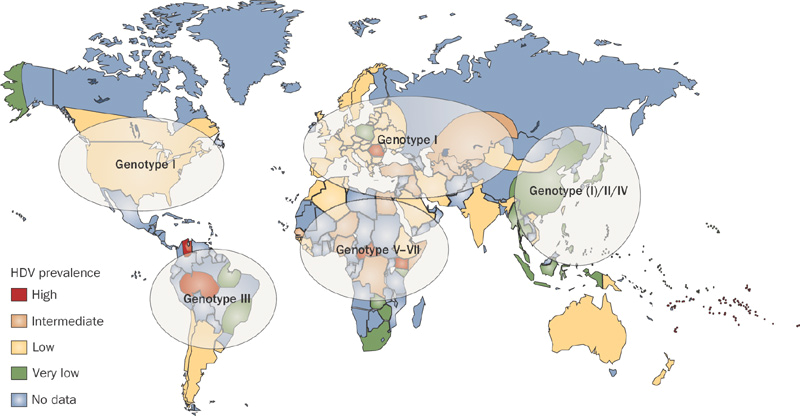 “Geographic distribution of HDV genotypes,” Nat Rev Gastroenterol Hepatol 2010, 7, 31–40.